Ivan Fischer conducts the Budapest Festival Orchestra and Collegium Vocale Gent. Mozart: Per questa bella mano; Clarinet Concerto in A (soloist: Akos Acs); Requiem. Budapest Festival Orchestra, Collegium Vocale Gent and Ivan Fischer at the BBC Proms. An all-Mozart programme of music composed in the last year of his life, including the Requiem and the Clarinet Concerto with soloist Ákos Ács. Presented by Ian Skelly from the Royal Albert Hall, London, on 26 August 2016. The story of Mozart's last months is almost as remarkable as the string of masterpieces he produced during them. Who was the cloaked figure rumoured to have commissioned Mozart to write the Requiem? We'll never know, but the deathly tread, furious fight and radiant hope of the music remain unparalleled. 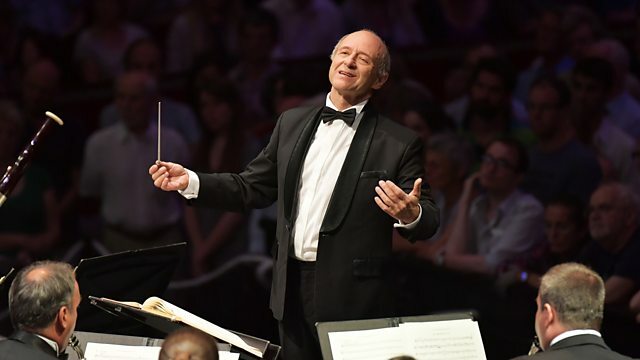 Iván Fischer brings his equally exceptional Budapest Festival Orchestra to the Proms, joined by one of Europe's leading choirs for the Requiem, alongside the autumnal shades of Mozart's late Clarinet Concerto. Performer: Zsolt Fejérvári. Singer: Hanno Müller‐Brachmann. Orchestra: Budapest Festival Orchestra. Conductor: Iván Fischer. Performer: Ákos Ács. Orchestra: Budapest Festival Orchestra. Conductor: Iván Fischer. Singer: Lucy Crowe. Singer: Barbara Kozelj. Singer: Jeremy Ovenden. Singer: Hanno Müller‐Brachmann. Choir: Collegium Vocale Gent. Orchestra: Budapest Festival Orchestra. Conductor: Iván Fischer. Performer: Kitty Whately. Performer: Joseph Middleton.